Welcome to Eco School page. We are the Eco Committee: 16 children from Years 3-6. Energy: Do we use too much of it? Litter: How can we reduce it? Recycling: How can we do more of it? Water: Do we use too much of it? Transport: Are we walking when we can? Healthy Living: What is our diet like? 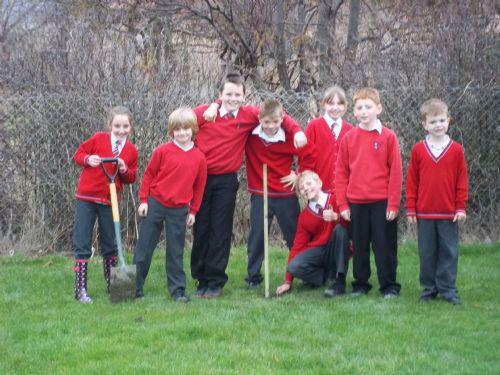 Biodiversity: Is our school good for wildlife? We have been focusing this year on Biodiversity. At Ysgol Bryn Hedydd we have a vast area of field that backs onto a railway line. We have been trying to improve this area for wildlife through the planting of tree saplings. So far we have managed to plant 100 trees! Here we are planting our 'Royal Oak' sapling!